Hob Sizes Hobs are available in a variety of sizes and diameters. Larger modules available on request. When a hybrid hob or a completely new design is needed, Star SU will supply the solution. Hob Material Hobs are available in a wide selection of PM High Speed Steels from PM-M4 to super alloyed steels like S-290 or ASP2080. Hob Coatings We coat our tools with Oerlikon Balzers PVD coatings: TiN, FNT (Futura Nano Top) TiAlN and Alcrona Pro (AlCrN). Star SU's complete line of involute gear hobs are designed to provide maximum productivity through increased tool life and less secondary finishing. We carry a complete range of involute gear hobs for your hobbing needs. Learn more about our involute hob types below. Involute Spline Hobs have straight sides teeth like a gear hob, and are usually of stub tooth depth. They are made in single or multiple thread designs, with diametral pitches ranged from 2.5/5 to 128/256 and pressure angles of 30°, 37.5°, or 45°. These hobs are designed to increase productivity of the hobbing process. Advancements in hob manufacturing has improved the quality to allow finish hobbing with a multiple thread hob. Depending on the lead angle, they will be either straight or spiral gashed. Single Thread Involute Hobs use straight angled sides for generating gears for maximum accuracy on gear hobbing machines. They are normally specified for processes where no subsequent tooth finishing operations are required, or where improved accuracy before tooth shaving operations is required. 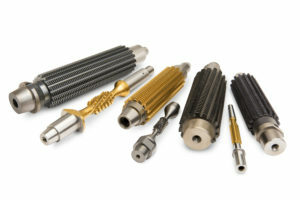 Worm Gear Hobs are part of specific tools that match the worm shaft with sharpening allowance. This plunge cutting tool is manufactured in shell or shank designs with straight or spiral gash. Lead angles up to 45° are available. Star SU Non-Involute Gear Hob offerings include sprocket, straight key spline, and special form hobs. Special form hobs are designed for tooth forms such as square shafts and conjugate forms. Sprocket hobs produce accurate finishes and are available in single and multiple threas designs. Straight or taperes key spline hobs can include a special feater to produce root clearance. Sprocket Hobs produce accurate finishes and produce the tooth form at one depth. These hobs are available in both single- and multiple-thread designs. Straight or tapered key spline hobs have specially curved tooth forms and are made in single and multiple thread types. They are used to produce at only one depth of cut. Special form hobs are produced for a wide variety of tooth forms such as square shafts, as well as conjugate forms for pump gear that transmit motion. Generally, these special hobs generate the correct tooth form at only one depth, so accuracy is critical. Customized Hob Shapes can be designed and manufactured to your exact specifications. We provide custom special drive hobs and shank hobs. Special Drive Hobs can be designed and manufactured for any special requirement – from OD and face clamping to clutch key ways with special hubs.